Hope you’re enjoying summer and practicing your Dancey Dance moves…we sure are! We’re looking forward to the start of our fall tour. Opening day is in Bethel, NY on August 27th. Thanks to all of you who have bought Gabba Party Packages and tickets. We’re happy to announce that the Gabba Party Packages are still available but they are a hot item and have sold out for several cities including New York, Los Angeles, Houston, and San Antonio. So be sure to buy yours before they are snapped up. We’re also thrilled to announce that our first show in Houston is completely sold out and that we’ve added another one at 2:30 p.m. on December 10th! Check out yogabbagabbalive.com/tickets for all of the ticketing options and to get tickets for your family if you haven’t already! $1 from each ticket sale will go to local Habit for Humanity sites! To get you pumped up for this tour I have a prize pack giveaway of “Yo Gabba Gabba! : Music is Awesome Volume 1” and the DVD “Yo Gabba Gabba! Clubhouse”. Not part of this package but soon to be released on August 24th will be Yo Gabba Gabba! : Music is Awesome Volume 2 featuring hit songs from seasons 1, 2 and 3 including super music friends weezer, jimmy eat world and songs from the show. 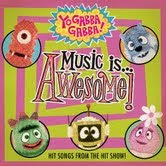 To enter giveaway: Tell me something that you LOVE about Yo Gabba Gabba! Or your favorite character! Leave your email address as part of this entry. 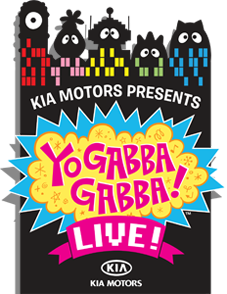 2) Check out TICKET locations of the Live Yo Gabba Gabba! Tell me the closes one to you! 5 entries and 5 entries for each ticket you purchase. 3) Comment on any of my other blog post and or enter any of my giveaways for 5 extra entries each entry! Unlimited! (giveaways on top right sidebar) Check back because I have more giveaways to post. 5) Tweet giveaway! Leave tweet links here. "Yo Gabba Gabba! Live Tour Prize Package Giveaway http://bit.ly/GabbaGabba"
Open to USA and Canada readers. I'm an Amazon Affiliate. The song "Don't Bite Your Friends" is just so catchy! LOL And the party in my tummy song too. Comment #30 was picked my Random.org! Congrats Tanya904. Thanks to all who entered!